This collection of nine "classic" Rock tunes spans five decades of rock history. 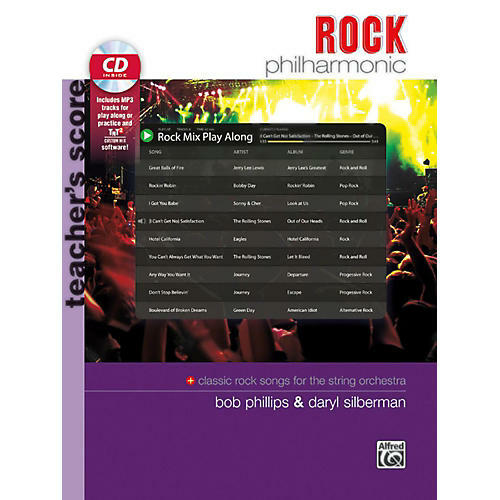 The arrangements in Rock Philharmonic contain complete versions and lead sheets of original hit songs by top groups and artists: Jerry Lee Lewis - Bobby Day - Sonny and Cher - The Rolling Stones - The Eagles - Journey - and Green Day. Each piece includes a flexible arrangement that allows the melody - harmony - and bass parts to be played by all sections in the string orchestra - like or mixed instrument groups - quartets - or trios---allowing players to learn the component parts of rock and roll - play the classic arrangement - create their own arrangements - or perform the tunes solo. In addition to string orchestra - the arrangements are also set for electric strings with optional guitar/electric guitar - piano - and drumset. The student book contains a full-length - two-page play thru version of the melody - which follows closely the original recording and includes clearly labeled Intro - Verse - Chorus - Bridge - and Outro sections. The bass and harmony component parts are then presented in a lead sheet format - along with a flow chart that matches the order of the Melody Line Play Thru. The teacher’s book contains a full score and reproducible piano and percussion parts. Guitar chords appear in all parts. For easy practice - the accompanying CD has two tracks for each piece---a complete track and a backing track---and TNT 2 software to mix the level of each instrument - change pitch - change tempo - and create loops. The CD can also serve as an aid to learning by ear. Titles: Great Balls of Fire * Rockin’ Robin * I Got You Babe * (I Can't Get No) Satisfaction * Hotel California * Any Way You Want It * Don’t Stop Believin' * Boulevard of Broken Dreams * You Can’t Always Get What You Want.